Sometimes my summer holidays come straight out of a Victoria Wood sketch: “72 baps Connie – you slice, I’ll spread”. Yup, it’s all about sandwich making. Summer is high season for packed lunches in our household, in our quest for living on less and making the most of it. Almost every time you read an article about saving money, it mentions packed lunches – at work, on outings, on holiday. That’s because packed lunches really do represent serious savings. Think about it – even if you only spend £5 a head in a cafe or sandwich shop, that’s £20 for a family of four. Try that for four days a week, for six weeks of the summer holidays, and suddenly you’ve shelled out almost £500. Ouch. So if you’d rather spend your cash on fun stuff not food stuff, here are my tried-and-tested tips for thrifty packed lunches. As with much of life, it’s a trade off between saving time or saving money. Buying pre-packaged food is quicker, but will almost always cost more than if you make it yourself. Splashing out on a box of quiche, fancy crisps, dips, packet of biscuits, can of Coke and a pot of melon and grapes is going to set you back a lot more than throwing together a ham sandwich and adding an apple, own-brand crisps, bottle of tap water and home-made cookie. 6p for a couple of raisin cookies (blog post with costing here, using 50g raisins in recipe here). Prefer buying to baking? Grab a pack of Clubs, Penguins or Kitkats when they’re on offer at £1 for 8, so 12.5p each, and it would still cost less than 82p. As you can tell from the example above, I’m keen on multipacks for producing packed lunches. Bulk buying is almost always cheaper than buying individual items. I stock up on multipacks of crisps, yogurts, fruit, fromage frais tubes, juice cartons and biscuits (anyone else get nostalgic when faced with a Penguin or an orange Club biscuit? Just me then?). A stash in the cupboard also means you can grab stuff quickly for any last minute outings. Making our own sandwiches means that everyone in our family gets something they actually want to eat. 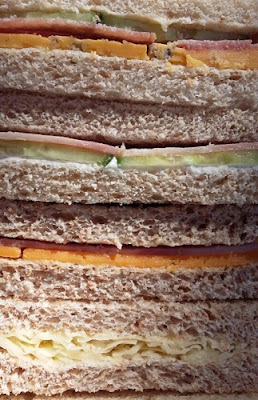 The only acceptable sandwich for one child involves medium cheddar (not mature), grated, with none of that pickle nonsense. Dead easy to make at home, tricky when faced with a menu that only offers artisanal cheddar cheese on rye with rocket and lovingly crafted chutney. Yet if my husband feels like eating salami and blue cheese, that’s fine and dandy too. I try to ring the changes with assorted different fillings (apart from the grated cheese fanatic): ham, tuna, hummous, egg mayo, salami or on special occasions soft cheese & smoked salmon (look out for value ranges, smoked salmon sandwich slices or offers). Additions like mango chutney, mayonnaise, onion chutney, pickle and mustard can liven up the taste for the adults. Sure, the mainstay of our packed lunches is sliced bread. But if we’re off on holiday, and doing a lot of thrifty packed lunches, I’ll throw in alternatives like rolls, burger buns, pitta bread, value range part-bake baguettes, bagels, wraps and sandwich thins. My sister’s children love oatcakes. Mine don’t. – cheese scones. Cheap, cheerful and quick to make. Best baked on the same day you want to eat them, or bake and freeze. – quiche, if your kids will eat it. One of mine will, one won’t. Curses. – greek salad pasta (pasta with tomato, cucumber, olives and value range feta aka “greek cheese”). My kids aren’t overly keen on sliced veg in sandwiches, but they’ll chew on a chunk of cucumber or some cherry tomatoes if offered separately. As a nod to health, I also take along a bag of chopped veg like carrot sticks, celery sticks, sliced peppers and even apple slices. When it comes to fruit, apples and satsumas travel well, and I take melon slices, grapes and strawberries in boxes. When on offer in summer, soft fruit like peaches, nectarines and plums can be good, even if messy. I’ve given up on bananas, after one too many squashed brown disasters. Even multipack juice cartons soon add up, so often we take refillable water bottles. If your kids are clamouring for variety, fill them with some sugar-free squash. My children love Fruit Shoots, but I’m only prepared to buy them on special offer, and have been known to substitute own-brand squash (shush, don’t tell them). The odd pack of ready-salted isn’t going to hurt anyone, but you might not want to take some every day. One super-cheap alternative is home-made popcorn, shovelled into freezer bags. If you want to avoid warm yogurt, stick a few yogurt tubes in the freezer. Bung them in the packed lunch bag in the morning, and they’ll defrost by lunch time, while keeping everything else cool too. Adding something sweet can provide an incentive to eat the healthy stuff, and will also help beat back demands for the tea shop. I genuinely like baking, so often include quick and easy stuff like choc chip or raisin cookies, fruit scones, lemon drizzle cake, banana cake, flapjack or muffins. I also keep a bag of hot cross buns or teacakes in the freezer as back up. Sometimes I even get organised enough to make jelly in little plastic boxes with lids, left over from weaning. Microwaves can unleash a whole new world of options for thrifty packed lunches, although admittedly they’re a bit tricky to take on a family outing. However, if you’re taking a packed lunch to work, take advantage of any microwave available. Soups, pies and stews provide welcome relief from a sandwich treadmill. I often cook extra food for dinner, so my husband can take a box of leftovers for lunch the next day. One caveat – best to avoid strong smelling curries and fish pie for the sake of office harmony. If you’re out and about without a packed lunch, search for a supermarket. Buying a meal deal or assorted rolls, filling and fruit, will almost always cost less than in a cafe or sandwich shop. Nipping in for multipack ice creams or lollies can also cut costs on hot days. What are your favourite packed lunch items? Any suggestions for more frugal food? I do like scones for packed lunches. When I've felt as though I couldn't face making another sandwich (or I forgot to set the bread machine the night before because it's the holidays and I'm out of routine) they've been great.10 minutes to make (I use Nigella's recipe) and 10 minutes in the oven- done! Because the flavourings are in the scone, it's economical too- 75-100g of cheese for 5-6 people and just some butter spread on each scone. I sometimes add chives or fried onion or olives or (very popular) chorizo. Everyone felt as though they were getting a treat, with enough left over to top a pizza the next day 🙂 On Thursday I used half a block of Feta (type cheese) plus some chives and thyme from the garden, which was really good. Some dried tomatoes would have gone well too (I make my own in the oven, put in a jar of oil and freeze- they last for ages). Pesto is a really good addition- I add slightly less liquid to compensate. If I make plain scones and freeze them, the children make them into mini pizzas to take in a packed lunch, spread with tomato puree or pesto. We like dips in our house, but I always make them- a drained tin of butterbeans, some lemon juice, garlic, olive oil and seasoning makes a surprisingly tasty dip. I add chopped parsley and/or chives. Cannelloni beans work well too, as do chickpeas. Add peanut butter or tahini to make it into hummus. I might make bread sticks instead of sandwiches to eat with it. Smoked mackerel pate is a favourite, either as a dip or a sandwich filling- smoked mackerel (value works fine) plus cream cheese and/or natural yoghurt. Add lemon juice, black pepper and chopped herbs to taste. I tend to make all of our bread and rolls, but do keep wraps in the freezer for emergencies. I like pitta breads too, but they're a pain to fill if they've been frozen- they get holes in and leak filling. My family will also eat pretty much anything if I put it in a wrap! Monday's packed lunch was lettuce and cucumber, the chopped meat left on the pork roast from the day before, plus finely diced roast potatoes and onions from around the joint. to stretch the small amount of meat left. With some mayonnaise and a little wholegrain mustard it was delicious! Flapjack is about the cheapest cake to make- I make a double batch and freeze some ready for packed lunches. So many great ideas, thanks a lot Hazel! Must try some of the dips you suggest. We ate cheese scones and flapjack yesterday, and I noticed that although I cook both frequently, I haven't posted recipes for either yet. Do love smoked mackerel pate too, tasty and quick to make. Hi, on thepioneewoman.com I saw a great tip the other day which should work perfectly for scones. You prepare your dough and then freeze the unbaked scones. They can be baked from frozen. See the link for details. I’m thinking of investing in a food flask for picnics when it’s cold, need to get imaginative in using it though! Thinking maybe hot dogs, but worried about how long is ok to keep meat warm.. ..